Not all SSDs technology is the same. In this review we are highlighting the differences between the different HPE branded SSD drives. HPE uses several different technologies and design requirements so that our server SSDs can meet the reliability and endurance requirements of server storage. HPE SSDs incorporate wear leveling and over-provisioning to meet the endurance requirements for enterprise environments. These technologies increase the lifespan of an SSD drive in an enterprise environment. Over-provisioning distributes the total number of writes and erases across a larger number of blocks and pages over time. On Enterprise SSDs, the over-provisioning can reach as high as 25 percent above the stated storage capacity. Wear leveling uses sophisticated algorithms that re-map logical SCSI blocks receiving frequent writes to different physical pages. It evenly distributes erasures and rewrites across the medium to maximize endurance. A pointer array on the SSD controller contains the logical-to-physical map. SSDs can recover or rebuild the map quickly after a power loss. ProLiant SSDs have power loss protection. It ensures that if the drive loses power (including hot plug removal), it can be ready in a short time. Power loss protection also ensures that user data in write cache writes to the drive. HPE SSDs can sustain a power loss without requiring the lengthy metadata rebuild process required for SSDs without power-loss protection. 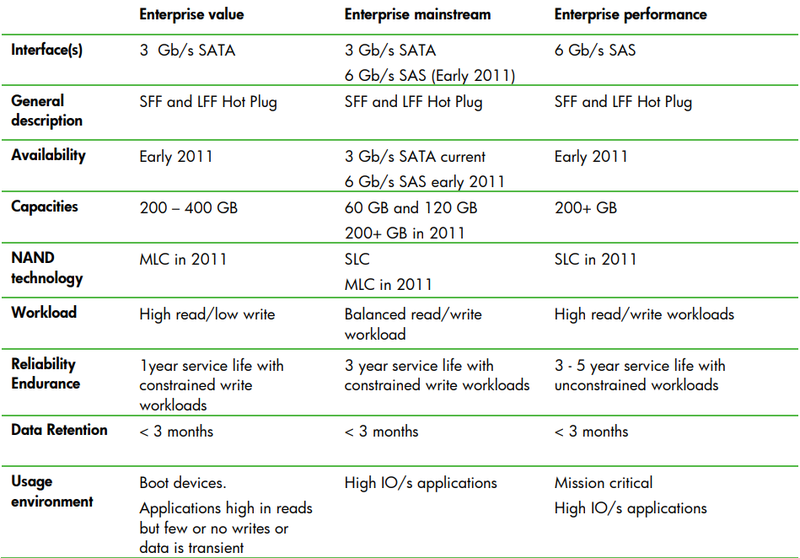 HPE supports three SSD Enterprise classes (Table Below) to meet the requirements of different application environments: value, mainstream, and performance SSDs. They all deliver I/O performance comparable to Enterprise spinning media drives. SSDs differ from spinning media drives primarily by the read/write workload levels they can support and their expected service life. Enterprise value SSDs provide relatively large storage capacities at low costs, but they do not have the endurance of the mainstream or performance SSDs. Creativity mainstream SSDs have smaller capacities but greater endurance than value SSDs. Enterprise performance SSDs from HPE have similar capacities to mainstream SSDs but have even greater endurance. Based on published workloads, we expect HPE SSDs to last the typical service life for a new server. The lifespan of NAND memory in SSDs is determined by the number of write/erase cycles it experiences. SSD endurance is different from disk drive endurance. A server SSD reaching the end of its service life is likely to start failing once it exceeds the NAND endurance limit. A SAS disk drive may continue operating for several years beyond its stated service life. An SSD removed from a system without power may not be readable after a short time, but most spinning media drives will retain their data for a decade or more. SSDs are unsuitable for use as archival storage because they do not have great data retention characteristics. Second generation HPE SSDs perform significantly better than the first generation from 2008. 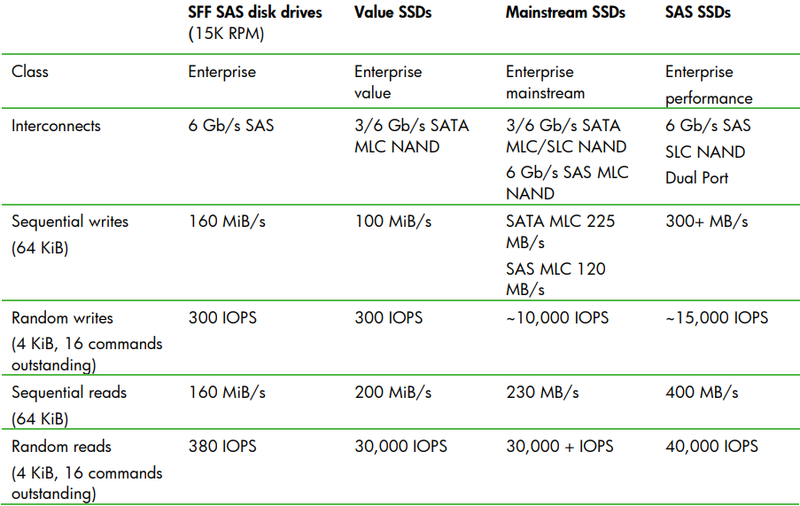 Table 6 shows that second generation midline SSD performance is comparable to Enterprise SAS drive performance. SSDs excel at random read operations, where performance can be over 100 times better than that of spinning media drives. HPE has industry-leading drive technologies to handle all of your storage requirements. All of their storage products are rigorously tested and certified for their targeted applications. 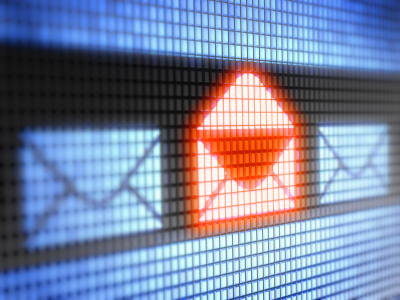 Many of you savvy users have already adopted simple email security measures. Such as immediately deleting vague emails and not clicking on attachments unless they come from a trusted source. As attackers employ greater sophistication, businesses need to build more sophisticated defenses. Within our customer base, the vast majority of Crypto Locker threats have been in the form of emails to random staff. It is so easy for these criminals to create an email that masquerades the “From:” field within the email so you can NEVER trust this field. If you ever suspect an email might not be from the recipient in the “From:” field there is a way to check in Outlook. This may be a little bit complicated for some but it show you who *actually* sent the email. 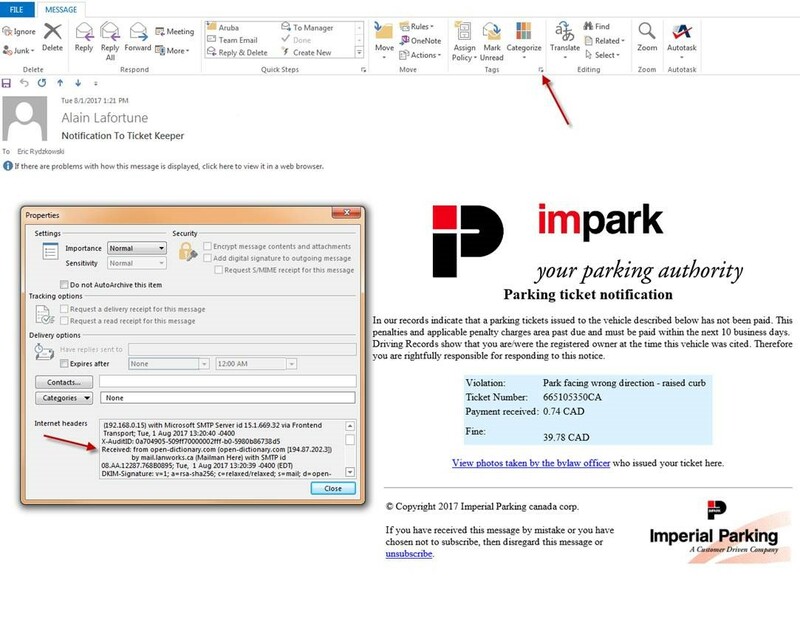 Below is an actual scam email indicating I have a parking ticket and it came from Alain Lafortune. When I click on the little tab shown by the top Red arrow, it opens the box containing the email header. When I look at the header I can see the actual sender and it came from “Open-Dictionary.com” which is clearly not a parking ticket company. If I am still uncertain, I can go to www.geoiptool.com and type the sender’s IP address: 194.87.202.3. Based on the output of this tool, I can now see this email originated from Moscow in Russia. I know without a shadow of a doubt that this is a SCAM. Ensure that your business email system includes a multi-layered, proactive security solution. Also, keep security and operating system software up-to-date. Enforce a robust password policy to ensure that employees use strong passwords and change them regularly. Establish clear procedures for communication of sensitive information. Be wary of any email that suggests a departure from normal security protocol. Instead of simply clicking “Reply,” obtain the supposed sender’s email address from a corporate address book and send a reply to that address. Before clicking a link in an email, be sure that the link is legitimate. Type the URL directly into the address bar, or hover your cursor over the link to display the full URL. As part of our thirty-year celebration, many of us have spent time looking back with warm affection for the early days of personal computing. There was a feeling of excitement for the changes in technology which truly felt like magic was at work. For those who did not experience this era, you may well not understand how important the “PC Revolution” was. My first experience with computers, didn’t involve a seeing a computer, a keyboard, or a monitor… what? We would write programs by using a pencil to fill in little boxes on computer cards (rectangular pieces of thin cardboard). You would put an elastic band around your stack of cards, your “program”, and send them off to a distant computer centre. A week later the cards would be returned to you, informing you that your program stopped on card 23, because the corner of the card got bent. You now would prepare a replacement card, put your elastic band around your stack, and send it away again. This process would repeat many times as you debugged your simple program, and after a couple of months you would have your simple program running. Interactive, it was not. Enjoyable? Not for me. 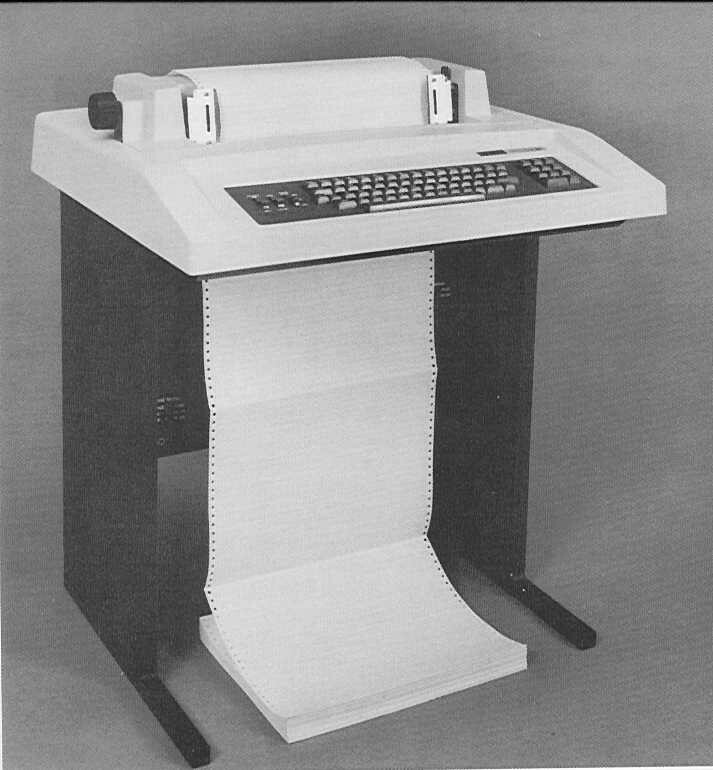 In later years we had access to teletype terminals, which gave you direct access to a remote computer. They did not have a monitor, but would print out responses from the computer. This was a big step forward as it gave you interaction with the computer system. But generally you were just accessing some running program, and not writing software. For me, the “magic” started to show itself when video terminals began to be available. It appeared to behave largely the way today’s computers do. You ran programs on it, and could write programs, and everything was displayed on a monitor almost instantly. The only catch was you couldn’t take it home, as the actual computer it was connected to was larger than your house, and from home few people would have any way to connect to it. But the future was being hinted at, and coming fast. The PC revolution started with a large number of different companies, each making their own PC, with little to no compatibility with software or hardware. Many of the early computers were actually designed to be gaming platforms, but that didn’t detract from their ability to run more serious applications. People were ecstatic that they could afford a computer… a personal version of a multi-million dollar mainframe, which would allow them to compute in their own homes. It was felt that a home PC, in some small way, allowed you to compete with big business, and the government….you had a Computer! 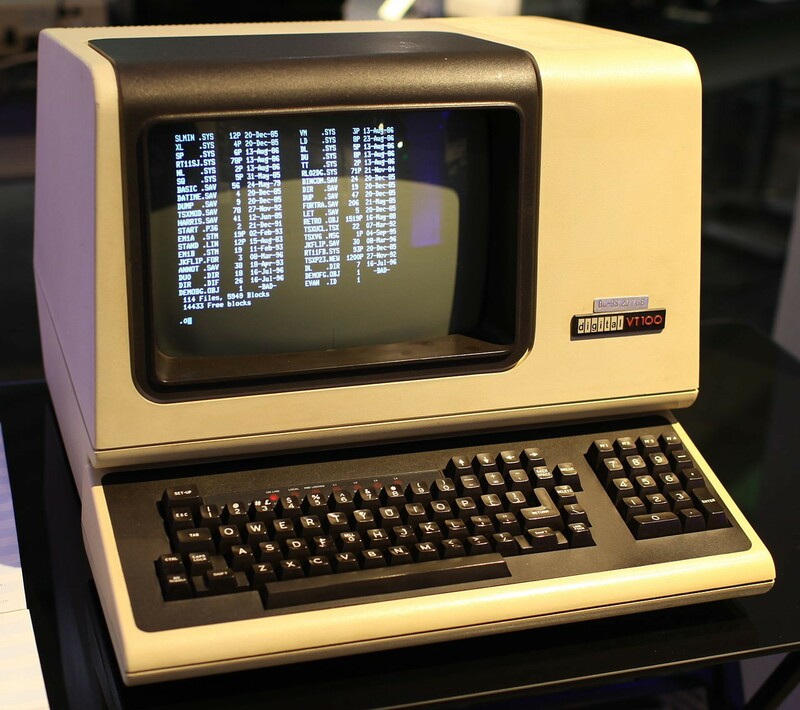 The next big event in the PC Revolution was the move to a standardized platform, starting with the IBM PC, and quickly followed by Compaq and others. By the mid-eighties, you could purchase PC’s from many different companies, and for the most part, your software would run on all of them. This standardization introduced competition in the industry, and drove pricing down so that most people could afford a computer if they wanted one. I spoke about the “magic” at the beginning. I’m not sure that I can properly describe what that magic was for me, and for many other enthusiasts. It had something to do with being able to write software to do whatever I wanted it to do. For many of us it was as simple as creating a program to catalog recipes… not a big deal, but it rewarded us with the joy of creating something successfully. From the perspective of 2016 this appears trivial, but before the PC came along, it was something you could not do. Today this enthusiasm, this “magic” is still very much alive. It is alive in the thousands of Open Source software projects that exist, that tens of thousands of people freely give their time and skills to develop. Hardware is not being left out either; there is a huge surge in the use of the Open Source Arduino microcontrollers, and similar ones such as the Raspberry Pi. I don’t want to forget the Maker movement, which is about doing just about anything, with anything, and having fun at the same time. If you are not familiar with any of the above, Google is your friend. Perhaps the magic is about the joy in people all over the world sharing their enthusiasm for these projects, and taking the time to help others who are interested in learning as well. You can experience the magic if you want. You just have to want it. Don’t forget to enter our “Blast from the Past” contest!